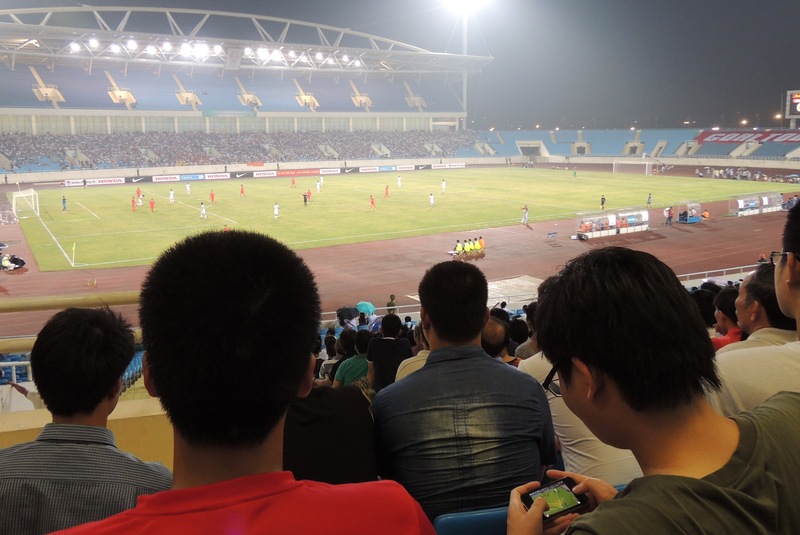 International break: a trip to the My Dinh national stadium and bricks for goalposts. With Ha Noi T&T on a good run of form it was time for a break from the Vleague, just when many of the European based players need to recharge it’s time for more International football. While England jetted off for a pointless (yet money spinning) friendly in the refurbished Maracana stadium in Brazil, the Vietnamese football Association had opted for a more interesting approach and one which will hopefully benefit the national team in the long-term. This was to be a two week training camp for the U23 National team, allowing the senior players a rest mid-season and the future stars a chance to shine prior to the forthcoming SEA Games in Myanmar. 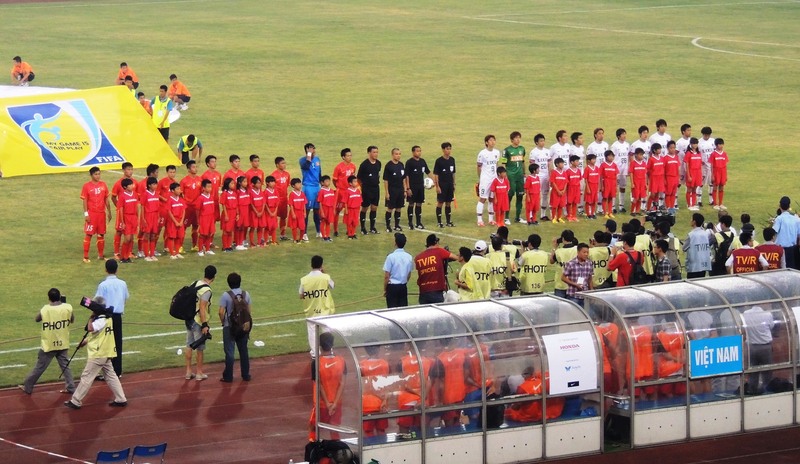 An interesting schedule was arrange including the visit of JLeague team Kashima Antlers (a match to commemorate 40 years of diplomatic ties with Japan), a ‘training’ match against HaNoi T&T and finishing with the visit of Myanmar U23 to played in Ho Chi Minh City. Being a football geek, I became rather excited about this odd match ups and had soon purchased my ticket for the visit of Kashima Antlers to the My Dinh National stadium. I wasn’t the only one, with social network sites and local media coverage also was getting excited about the ‘next generation’ of national players. Fortunately I didn’t need to sneak out of work early for this one and arrived in My Dinh, a district in the south west of Hanoi, with an hour to spare. It’s about 20-30 minutes away by bike in a new area of the expanding city. Like other stadiums here in Vietnam, the touts/hawkers were out in force, even arguing and being pushed away from the official ticket booths that lined the approach to the stadium. The road directly outside the ground is huge, with no real markings and resembles something out of ‘wacky races’, with cars, trucks, motorbikes, bicycles and pedestrians all choosing their own destiny. One area also gave way to impromptu football pitches where groups of young local guys had gathered bricks to stand up and form a line that were to be used as goals. A slightly different take on the ‘jumpers for goal posts’ that I’m so familiar with. And I certainly wouldn’t want to attempt any sliding goalmouth clearances! More and more fans started to arrive and there was a real buzz of anticipation starting to build; I also noticed the arrival of the ‘T&T Fan group’ complete with drums and big smiles. Unfortunately the heavens opened and there was no time to grab some food from one of the numerous hawker stands selling Banh Mi (pate/egg baguettes) and Xoi (sticky rice with stuff). I was slightly concerned as my ticket clearly stated row 1, I’d be getting wet then. I followed the T&T fans towards the entrance hoping that at least wet it would be a fun atmosphere, only for my ticket to be inspected and turned away. I was, in fact, due to be sat on the other side of the stadium, a rather tedious and wet walk around the huge concourse. Luckily for me, I was handed a fan (which was to be hugely appreciated with the rising humidity) and was still able to purchase my pre-match Banh Mi, which for the most part was delicious. The lower seats were soaked so, along with many unfortunate fans, I trudged up the stairs towards the covered areas. 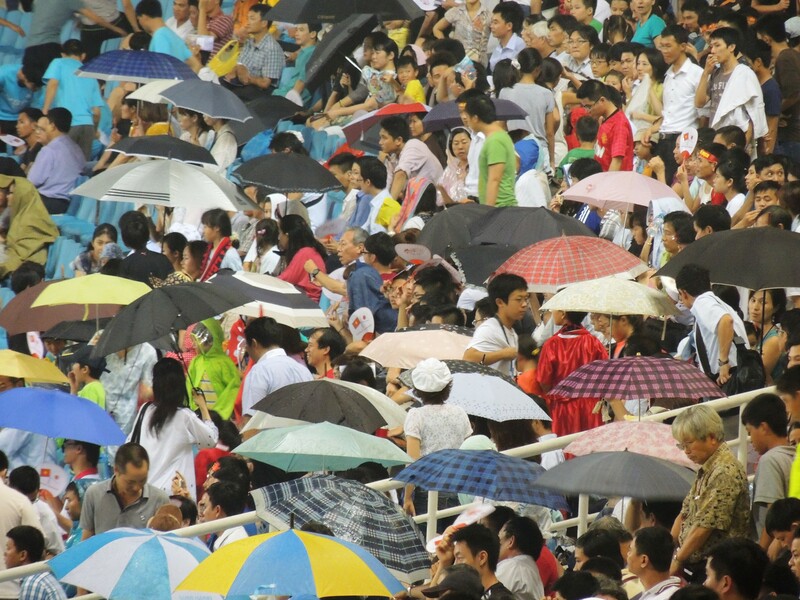 Allocated seating doesn’t apply in Vietnam if it rains. I found myself sat next to a couple of local journalist, complete with laptops and timesheets. I pulled out my moleskin notebook and pretended I was meant to be amongst them in these rather nice seats! The fans really seemed to be enjoying the occasion, certainly more than the previous international I’d attended against Malaysia, and with kick off approaching more kept arriving and filling the limited amount of dry seats left. As the game got underway the Vietnamese fans roared in support of these young players and each time as player in red picked up the ball they were eagerly urged forward. The players responded and started to play at a lively fast pace. Where the young players lacked the skill and composure of their more illustrious opponents, they certainly made up with it in enthusiasm and endeavor. Early in the second half, Vu Minh Tuan sent the home fans in to delight as his freekick went straight through the defensive wall and in to the bottom corner. 1-0. This only seemed to wake up the JLeague team, who clearly didn’t want to be there as much as the home team and within ten minutes they had turned it round. 2-1, with goals from Yuya Osako and Atsutaka Nakamura. This didn’t deter the home fans who showed appreciation of the visitors as they clapped the goals against their team and then continued to encourage attacking play. With ten minutes remaining, Hoang Danh Ngoc scored a deserved equaliser for Vietnam. Ten more frantic minutes and the final whistle blew on an entertaining 2-2 draw. It was a great evening at the My Dinh, especially as the local supporters were very passionate and the team certainly put on an encouraging performance.